With the hustle and bustle and all that’s going on in my life right now, I’m trying to choose fast and easy projects this Easter so that I can still help make the holiday fun for my family without sacrificing quality time with them. But I didn’t just dip the pretzel rods and call it a day. Instead I rolled the pretzel rods in some pastel sprinkles for a colorful burst and a fun way to take this from an everyday treat to a themed Easter dessert. And with just a change of the sprinkles or color of your candy melt, you can make these dipped pretzel rods for any holiday or occasion. This is such an easy, standby dessert, that looks harder than it is. 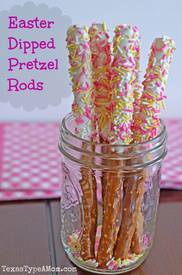 These dipped pretzel rods are the perfect treat when you want something a little salty and a little sweet. But beware, these are addictive so I challenge you to just have one!